Historic Macon's preservation committee uses Macon's Fading Five to create strategic preservation plans for each of the listed properties. Properties will remain on the list until the property is no longer under threat or the preservation committee determines it has been appropriately preserved. The Coaling Tower is the only new addition to the Fading Five list in 2018. Built in 1910 for the Central of Georgia Railroad, the Coaling Tower is a relic of Macon’s booming industrial heritage. Sometimes referred to as a “tipple” the structure was purpose built to replenish coal for the busy rail yard. The chute sits on a 22 acre parcel that once housed the Georgia Railroad car shops and massive roundhouse complex. The unique structure was used as a coal chute until 1965 when it was purchased by current owner, Tranco Railcar, Inc. who has since used the property for rail car repairs. The Coaling Tower is threatened with demolition by neglect. When buildings or structures are no longer functional or serve a purpose it is challenging to prioritize maintenance or upkeep. HMF connected with Transco last week and hopes to continue the dialogue to find a long term preservation solution that would be relatively straightforward – the tower would be maintained in its current state and be interpreted and highlighted for its contribution to our community’s history AND today’s social media. 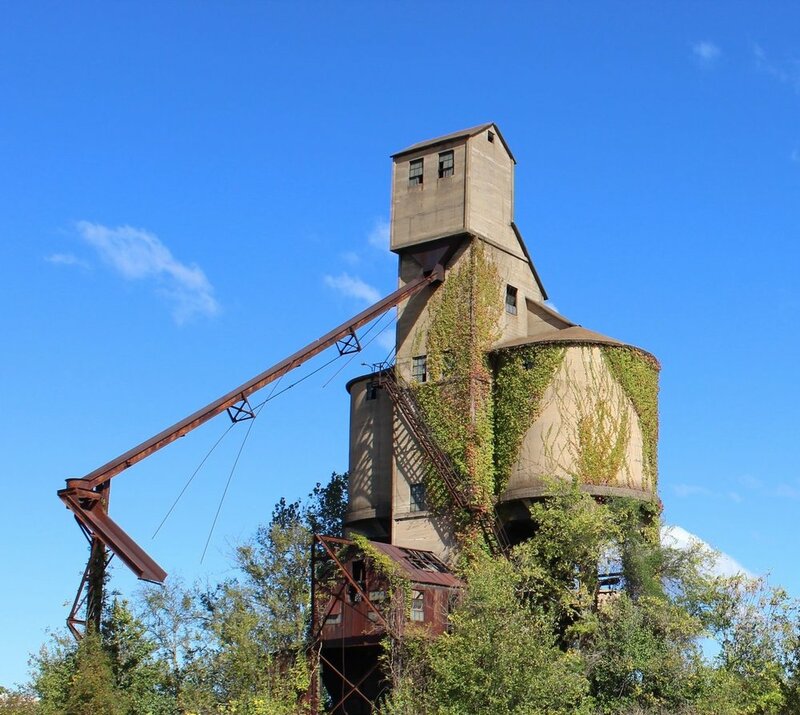 This may be Macon’s most prominent Instagram spot – just google the coal tower and you’ll be amazed at all the pictures. The Guy E. Paine House is a contributing property in the Cherokee Heights National Register of Historic Places District. The house was built circa 1912 in Italian Renaissance style as part of the original development of the Cherokee Heights neighborhood and has had a number owner-occupants in its lifetime. The first owner was Guy E. Paine, who was recruited to Macon by Henry C. Bagley to work for the Penn Mutual Insurance Company. Although Paine had visited Macon on business before, he had been living in Chicago prior to coming back down South. Paine had an illustrious career in Macon. He served as the President of the Chamber of Commerce in 1915 and 1916, President of Rotary and spearheaded Rotary’s military committee. Paine and the committee were instrumental in getting the infrastructure improvements necessary for Camp Wheeler. The Paine family owned the house until 1971. The house has been foreclosed on twice since 1998. A 2013 image shows the property in at least fair condition, but it is now heavily overgrown and shows signs of neglect. The solution for this property is purchase and rehabilitation by a sensitive new owner. 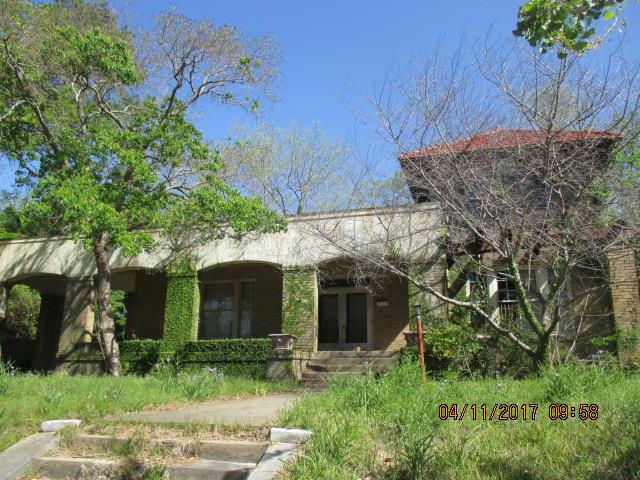 As a contributing property in the Cherokee Heights National Register Historic District, it is eligible for preservation incentives to assist with its rehabilitation. HMF has had productive conversations with the property owner this month and look forward to the ongoing dialogue to find a new owner to love this house and help bring new investment to Cherokee Heights. Although parts of what was historically known as Cotton Avenue go by many names, the original thoroughfare still exists. During the twentieth century, Jim Crow laws forced African Americans to establish separate business districts in Macon. The Cotton Avenue District became one of these areas and grew into a major center of black business. After integration, black-owned businesses had new competition with other downtown establishments, and some in this area closed their doors. Today, this district is under greater development pressure than almost anywhere else in Macon-Bibb County. The large workforce of the area combined with the number of vacant buildings makes structures in this area prime targets for demolition. Similarly, the demand for land for commercial purposes has the potential to force out smaller businesses, aging church congregations, and community institutions like the Ruth Hartley Mosley Memorial Women’s Center. Fading Five listing brought much needed attention to Cotton Avenue, preventing further demolition over the past three years. Progress is underway on the buildings once held by Albert Billingslea. This stretch of buildings has long been in question, but in December 2017 they were acquired by Virgil Adams and Brian Adams who are using historic tax credits to rehabilitate the buildings. For the past two years, HMF worked with the Cotton Avenue Coalition to host the Cotton Avenue Revival Festival, tours of the neighborhood, and a concert in High Street Park. In September, the district will be featured for tours for the Statewide Preservation Conference. Completed in 1920, the Train Recreation Center was built by the Bibb Manufacturing Company for their workers in the nearby mill village and is the only structure built by the company remaining in the downtown area. This impressive Arts and Craft style facility was part of a national reform movement that demanded textile mills treat their employees and their families more humanely. Free recreational facilities were one way to achieve this goal. The company actually acquired this land back in 1850, when it was known as the Macon Manufacturing Company in order to supply water to the nearby mill. The lot sits on a “Never Failing Spring,” making it an ideal spot for a reservoir. Bibb Manufacturing sold the entire property back to the City of Macon in 1966 with the stipulation that it must always be used for public or charitable purposes. The City continued to use the building as a recreation center until at least 1980. The building has sat vacant for several years. The Train Recreation Center is in danger of demolition by neglect. Although the large hole in the roof has been covered with a tarp, the entire structure is suffering from neglect. In October 2017, Mayor Reichert proposed spending $1.5M in blight bond funds to rehabilitate the building to be used for the Georgia Cooperative Extension office thereby saving the County monthly rental payments for the Extension office. The proposal was met with a chilly reception, but ultimately if the County wants to make blight a priority they should start with the properties under their stewardship and lead by example. HMF stands ready to work with Macon-Bibb County officials to find a compatible use and funds for the prominent Train Recreation Center. This building was originally the First Congregational Church built in 1917 and was a historically African American church in the Pleasant Hill neighborhood. The congregation was established in 1868 and immediately began working the “higher development and improvement” of Macon’s black community. The church had very close ties with Ballard Hudson Normal School because of their mutual goals to increase education and civic-mindedness in African Americans, despite the harsh laws of segregation throughout the area at that time. The First Congregational Church remained in this building until 1991. The structure was then vacant between 1992 and 1997, before it was purchased by the Booker T. Washington Foundation, whose main community center was then located across the street. The community center has used the building for everything from a daycare to a dance studio known as the Bobby Jones Center for the Performing Arts since purchasing it in 1998. However, they shuttered the building in the last few years because they do not have the funds to make some necessary repairs. The threat to the Bobby Jones Performing Arts Center is demolition by neglect. The Booker T. Washington Foundation is no longer active and does not have the personnel or funds to look after the structure. The solution for the Bobby Jones Performing Arts Center is redevelopment by a sensitive new owner. Since the building is currently owned by a moribund non-profit, it will be difficult for a new owner to acquire. HMF is working to find new owners for the building and working with Tonja Khabir, 2018 Knight Emerging Leader, to demonstrate the potential of the building to revitalization of the neighborhood. The Train Recreational Center is in danger of demolition by neglect. Although the large hole in the roof has been covered with a tarp, the entire structure is suffering from neglect. Since being added to the Fading Five in 2016, several uses have been vetted and HMF continues to work with Macon-Bibb County to find a viable use for the important building. The Mayor and City Council of Macon sold the land that both of these two houses sit on to A.E. Barnes on June 2, 1906, and the parcel has remained one unit ever since. Designed and built as duplexes, countless tenants have resided in these buildings. Eventually, A.E. Barnes III, noted Macon businessman and real estate developer, inherited the property, and he sold the property for $5 to his son Waddell Barnes on November 2, 1972. The property remained in the Barnes family until July 29, 2015 when it was sold to the Macon-Bibb County Hospital Authority. The threat to the A.E. Barnes Duplexes is pending demolition. In June 2017, the Hospital Authority offered the buildings and a nearby lot to HMF if we could move the houses by March 2018. Additionally, they offered to donate the expense they would incur on demolition, which is estimated to be $20,000. Unfortunately, the cost to relocate the houses is estimated at over $100,000 per house. Given the impracticality and high cost of relocating the masonry duplexes, HMF hopes to continue working with Navicent to pursue other options to reuse these buildings in situ. The solution for this property is purchase and rehabilitation by a sensitive new owner. 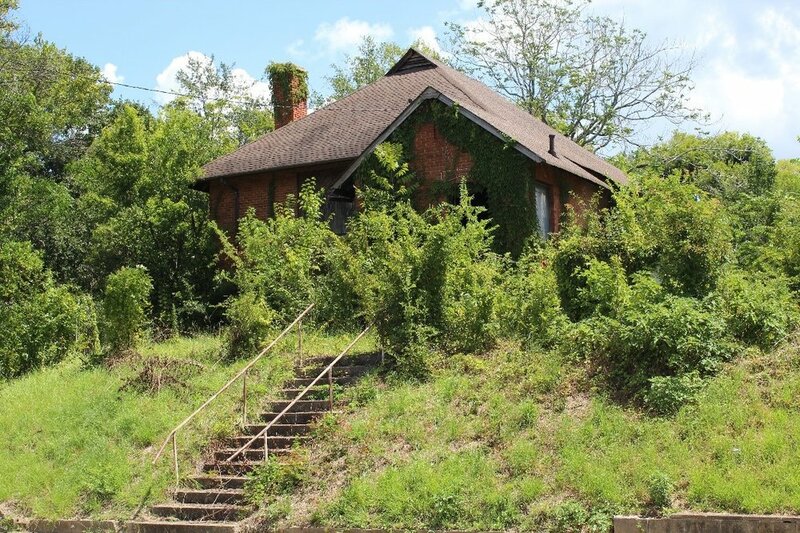 As a contributing property in the Cherokee Heights National Register Historic District, it is eligible for preservation incentives to assist with its rehabilitation. HMF looks forward to working with the property owner to preserve this unique house. Photo courtesy of the Macon-Bibb County Tax Assessor. The solution for the Bobby Jones Performing Arts Center is redevelopment by a sensitive new owner. Since the building is currently owned by a moribund non-profit, it will be difficult for a new owner to acquire. Historic Macon is actively seeking solutions to this issue and welcomes any information about its ownership or possible ways for a new owner to buy the building. Although parts of what was historically known as Cotton Avenue go by many names, the original thoroughfare still exists. During the twentieth century, Jim Crow laws forced African Americans to establish separate business districts in Macon. The Cotton Avenue District became one of these areas and grew into a major center of black business. After integration, black-owned businesses had new competition with other downtown establishments, and some in this area closed their doors. Today, this district is under greater development pressure than almost anywhere else in Macon-Bibb County. The large workforce of the area combined with the number of vacant buildings makes structures in this area prime targets for demolition. Similarly, the demand for land for commercial purposes has the potential to force out smaller businesses, aging church congregations, and community institutions like the Ruth Hartley Mosley Memorial Women’s Center (pictured). Fading Five listing brought much needed attention to Cotton Avenue, preventing further demolition over the past two years. In March 2017, HMF worked with the Cotton Avenue Coalition to host the Cotton Avenue Revival Festival. In re-listing the district, Historic Macon plans to focus on two specific action items. First, HMF plans to advocate for stricter zoning regulations regarding demolition in this area. Secondly, Historic Macon will continue to support the grassroots Cotton Avenue Coalition, and its work to encourage the respectful growth of this district. Although parts of what was historically known as Cotton Avenue go by many names, the original thoroughfare still exists. During the twentieth century, Jim Crow laws forced African Americans to establish separate business districts in downtown Macon. Cotton Avenue became one of those districts and grew into a major center of black business with entrepreneurs working as barbers, shoemakers, lawyers, dentists, and everything in between. After integration, black-owned businesses had new competition with other downtown establishments, and some in this area closed their doors. Today, this district is under greater development pressure than almost anywhere else in Macon-Bibb County. The large workforce of the area combined with the number of vacant buildings makes structures in this area prime targets for demolition. Similarly, the demand for land for commercial purposes has the potential to force out smaller businesses and aging church congregations. Fading Five listing brought much needed attention to Cotton Avenue, preventing further demolition in the past year. In re-listing the district, Historic Macon plans to focus on two specific action items. First, HMF plans to advocate for stricter zoning regulations regarding demolition in this area. Secondly, Historic Macon will provide assistance to current Cotton Avenue tenants who would like to remain in the district. In particular, Historic Macon will work with Steward Chapel AME Church at 887 Forsyth Street. Founded in 1865, Steward Chapel AME Church has long been involved in the pursuit of both religious freedom and social justice. The congregation laid the cornerstone of its magnificent structure in 1889, and this church has continued to be “a beacon of light in a world of darkness” ever since. By again declaring the Cotton Avenue District ENDANGERED and highlighting Steward Chapel AME Church, Historic Macon plans to continue working for a solution for the whole area, as well as working with the energetic new leadership at Steward Chapel. UPDATE: Historic Macon is part of the Cotton Avenue Coalition, a group of community leaders and activists who have a vested interest in the preservation and revitalization of the Cotton Avenue district. In March of 2017, the Coalition held the Cotton Avenue Revival Festival as a sanctioned Cherry Blossom Event. The Coalition won a Downtown Challenge Grant from the Community Foundation of Central Georgia to host the festival. The Coalition continues to work together to promote and preserve the district and has planned a planning retreat for the summer of 2017. Bibb Manufacturing Company built the Train Recreation Center in 1920 for its workers in the nearby mill village. Today, it is the only remaining structure built by the company in the downtown area. The impressive Craftsman style facility was part of a national reform movement that demanded textile mills treat their employees and their families more humanely. Free recreational facilities were one way to achieve this goal. The company actually acquired this land back in 1850, when it was known as the Macon Manufacturing Company in order to supply water to the nearby mill. The lot sits on a “Never Failing Spring,” making it an ideal spot for a reservoir. Bibb Manufacturing sold the property to the City of Macon in 1966 with the stipulation that it must always be used for public or charitable purposes. The City continued to use the building as a recreation center until 1980 and was later utilized as a daycare until the 1990s. The building has stood vacant since. The Train Recreation Center is in danger of DEMOLITION BY NEGLECT. Although the large hole in the roof is covered with a tarp, the entire structure suffers from rot and water damage. There are many possible solutions for this building that meet the deed-stipulated requirement for public or charitable purposes. HMF looks forward to working with Macon-Bibb County to find a new use for the property. The state of Georgia granted this land to Ann Rich in 1821 after the Native Americans were forcibly removed from it. In 1901, La Societe Catholique Religieuse purchased a 100-acre tract of land as a retreat for the students and faculty of St. Stanislaus College, which La Societe oversaw. The Jesuits of the College constructed a shrine to Saint Bernadette shortly after purchasing the property, along with a reflection pool. The shrine has a large central entrance with a smaller cavity to the left where a fireplace is still visible. Over the top, there is a niche that originally contained a statue of the Virgin Mary, though it is no longer there. This shrine is one of the many copies of the original in Lourdes, France. Almost all of St. Stanislaus’ campus burned in a massive fire in 1921. For a few years, La Societe attempted to raise funds to rebuild the college with no success. They sold the land, which now contains many historically and architecturally significant homes. At the same time in 1929, La Societe sold the tract of virgin forest containing the Grotto to private developers, and the property has been privately owned ever since. The threats to the Grotto are DEMOLITION BY NEGLECT and ACTIVE VANDALISM. The solution for the Grotto is conservation easements and public access. The Grotto needs visitors who are interested in its history and preservation to discourage vandalism. The surrounding timber also needs a management plan to ensure this old growth hardwood remains for future generations. The John B. Brooks House sits on land originally known as the J.P. Lamar Sr. property in the Vineville Historic District. Built in 1908, it is indicative of the type of houses built in Vineville during the early twentieth century. The Brooks family enjoyed the beautiful features of this house from 1908 until 1953. During that time, the family received quite a bit of attention in the Macon Telegraph. Shortly after building this house, John Brooks appeared in court as a defendant for distilling whiskey. The City of Macon and Bibb County began establishing prohibition laws before the Prohibition Act of 1921, and James Brooks was in violation of those laws as early as 1916. Not all the coverage the family received was negative, however. John Brooks’ daughter, Eva Mae Brooks, was nominated as one of the most popular young ladies in town during a vote held in the Macon Telegraph in 1933. John Brooks’ son, James, fought during World War II, rising to the rank of corporal in the 770th Field Artillery Battalion. After the Brooks, various owners and tenants resided in the house over the years. In 2007, Lamar Street Limited, LLC acquired the property along with many others along Lamar Street. The John B. Brooks House is in danger of DEMOLITION BY NEGLECT. As a contributing structure in the Vineville National Register Historic District, it is eligible for preservation incentives and is calling out for a new family to move in and make it home. The solution for the John B. Brooks House is rehabilitation by a sensitive new owner. The First Congregational Church, a historically African American congregation in Pleasant Hill, constructed this building in 1917. The congregation was established in 1868, and immediately dedicated its services to the “higher development and improvement” of Macon’s black community. The church had very close ties with Ballard Hudson Normal School because of their mutual goals to increase education and civic-mindedness in African Americans, despite the harsh laws of segregation throughout the area at that time. The First Congregational Church remained in this building until 1991. The structure stood vacant between 1992 and 1997, before it was purchased by the Booker T. Washington Community Center. The Center used the building for everything, from a day care center to a dance studio. During this use, the building became known as the Bobby Jones Performing Arts Center. The Center was named in honor of Bobby Jones, PhD, the first African American professor to earn tenure at Mercer University. However, the Center shuttered the building a few years ago due to lack of resources to make necessary repairs. The threat to the Bobby Jones Performing Arts Center is DEMOLITION BY NEGLECT. The Center does not have the funds to properly seal the building or replace the roof, which is leaking in several places. The solution for the Bobby Jones Performing Arts Center is a long-term viable use that contributes to Pleasant Hill once again. Macon’s central location on the rail lines and its access to the Ocmulgee River made it a booming industrial scene in the 1800s. Many foundries and iron works were needed to supply the cotton industry, railroads and farmers. Founded in 1859 on Fifth Street, Schofield Iron Works grew into a large company, later known as Taylor Iron Works, to help meet the demand. The two-story masonry building was strategically built next to the Union Depot where major rail lines converged. Schofield was well known for its steam-powered cotton presses and sold equipment globally from South America to Japan. The company’s building reflected this prestige. The decorative brickwork on the second story and above the windows on that floor resonates with that legacy. Schofield continued operations in the growing complex until 1924, when the company moved to a new plant on Edgewood Avenue. Although Schofield moved out of this building, J.H. DuBose quickly reused it from 1904 to 1912. Then in 1912, the Adams Manufacturing Company moved into the building and stayed until 1940. At various times, other businesses shared this large space, including three wholesale produce and grocery firms from 1915 to 1920. In 1942, the C.W. Farmer Company decided the large structure would be ideal for their wholesale retail and mill supplies business. C.W. Farmer remained in the building until the company closed in 1979, at the same time many mills across the southeast closed. The buildings sat vacant for a couple years before L&M Manufacturers moved in during the mid-1980s. That company moved out in 1995, and the complex has been vacant ever since leaving it in a state of demolition by neglect. The buildings are contributing to the Macon Historic District and the Macon Railroad Industrial District, making it eligible for state and federal historic rehabilitation tax incentives. Historic Macon Foundation looks forward to working with Magnolia State Bank to find a new buyer who can reuse most, if not all, of these significant industrial buildings. As Downtown Macon continues to blossom, the Schofield Iron Works Complex is well situated for redevelopment but must be sold quickly and at a fair price given the substantial investment that needs to be made. UPDATE: The Urban Development Authority purchased Schofield Iron Works and is currently working with developers to create an appropriate rehabilitation plan for the warehouse. Alexander IV Elementary School was established in 1932 as the fourth free school supported by the Elam Alexander Trust. Mr. Elam Alexander, a notable architect, believed that free, quality education was paramount for the success of individuals, which in turn would lead to the success of Macon as a community. During his lifetime, Mr. Alexander gave generously to many educational institutions, and in his will, he set up the Alexander Free School Board, later known as the Elam Alexander Trust. This organization continues to promote education in Macon-Bibb County. The excitement continued after Alexander IV’s opening. Ms. Nell Collins, who both taught the seventh grade and served as the first principal, asked the Parent Teacher Association to hold a special tea, which formally unveiled the school in November 1932. Just a month earlier, a plaque was dedicated to Elam Alexander at the front entrance of the school. That plaque is still in place today. Alexander IV’s prominent role in the community continued in many ways through the twentieth century. For instance, the school fielded a dominant football team for Macon’s annual Pony Bowl, a football game played around Thanksgiving, from 1949 to 1960. The school’s integral role in the community came to a close in June 2011, when Alexander IV closed its doors to students. Today, the building’s steeply pitched gables, exposed beams, and intricate ornamentation stand empty to students. 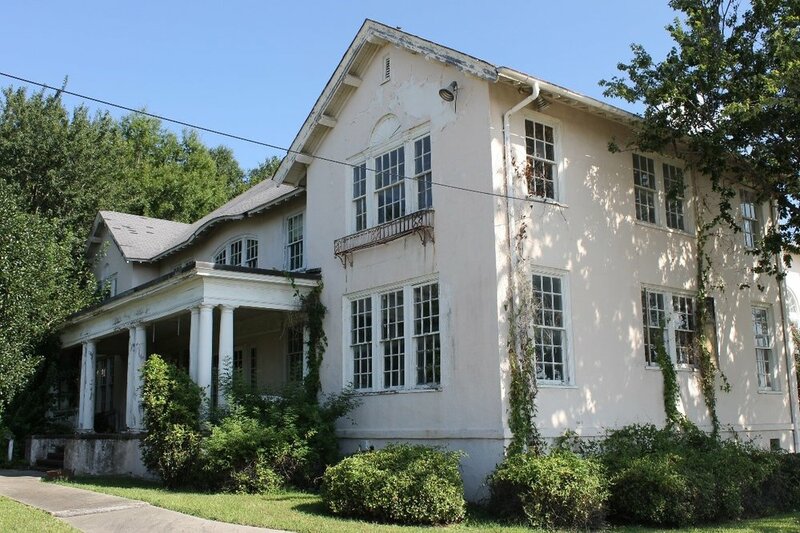 The Bibb County Board of Education declared the building surplus in 2013 and is seeking a new use for the significant building, which is a contributing building in the proposed Ingleside National Register District. Historic Macon Foundation looks forward to working with the neighbors and the Board of Education to find a new use for the iconic school building. Across the country school buildings have been adapted to multiple uses, and we are confident Alexander IV will once again be an anchor and asset for the community. UPDATE: The Bibb County Board of Education approved the sale of Alex IV to the Macon-Bibb Country Land Bank Authority. The Land Bank Authority will hold the building as Historic Macon works with a committee to send out a request for proposal to developers. Dover Development has been selected to renovated Alex IV into a senior living facility. Read more. UPDATE: Historic Macon published a walking tour of borchure of Cotton Avenue District in February 2016 to raise awareness about this area's historic significance and the intense development pressure the district is experiencing. Although today parts of what was historically known as Cotton Avenue go by different names, portions of the original neighborhood still exist. Cotton Avenue was the primary thoroughfare for cotton bales coming from rural farms into Macon. The gentle downhill slope of this road made it ideal for carts taking the bales down to barges on the Ocmulgee River, where they could be easily transported to gins. Around this thriving agricultural economy many businesses sprang up in the 1800s. During the twentieth century, Jim Crow laws forced African Americans to establish separate business districts in downtown Macon. Cotton Avenue and the nearby streets became one of those districts and grew into a major center of black business with entrepreneurs working as everything from barbers and shoemakers to lawyers and dentists. The first licensed African American attorney in Macon had his office in this area, as did Dr. D.T. 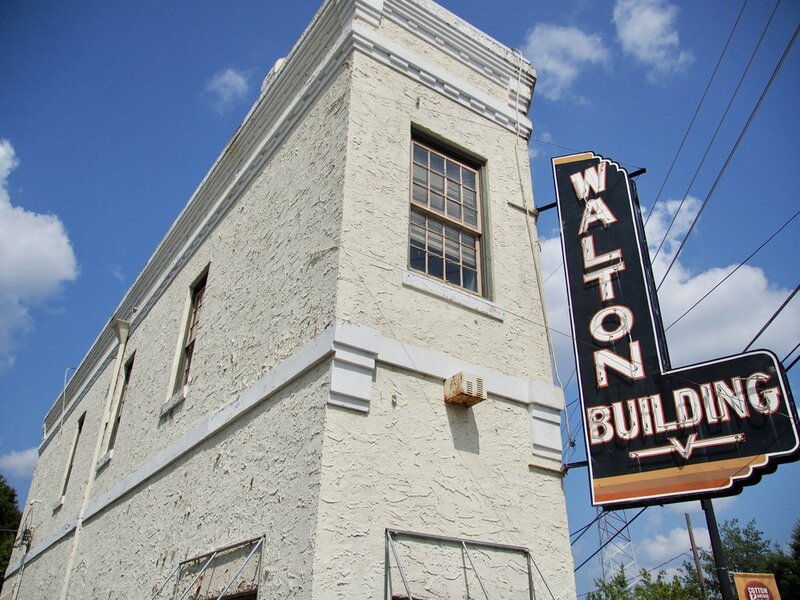 Walton, Sr. Walton worked as a dentist, but his contributions as a civil rights activist are what earned him the honor of having the portion of Cotton Avenue where he worked named after him. After integration, black-owned businesses had new competition with the other downtown businesses, and some in this area were forced to close their doors. But one well-known entity opened its doors Cotton Avenue during this time – Capricorn Records. Capricorn Records is known as the label that launched the southern rock genre with records from the Allman Brothers Band, Marshall Tucker, and Wet Willie. Before Phil and Alan Walden established Capricorn though, they partnered with Otis Redding to form Redwal Music. Their office, which was the first integrated office in Macon, was located at 535 Cotton Avenue, because they could not rent space anywhere else downtown. The Cotton Avenue District is under tremendous development pressure. In less than a year, both Tremont Temple Baptist Church and the Charles Douglass House were demolished to make way for new development. The Cotton Avenue District and the existing historic buildings are ideal for new and existing businesses. Additionally, there are several surface parking lots that are well suited for new, higher density developments. Historic Macon Foundation looks forward to working with property owners and neighborhood representatives to ensure the character of the significant neighborhood is not lost forever. UPDATE: Historic Macon has been working to raise awareness and educate the public about this importance and significance of the Cotton Avenue District. On February 27, Historic Macon unveiled a walking tour brochure of the district and held a trolley tour led by George Muhammad. During 2016 Preservation Month, Historic Macon hosted another walking tour of the district. UPDATE: A family has purchased the Boonybrae-Bedgood House and will rehabilitate it as a single-family home, its original use. Rehabilitation is well-underway. Known by many family names, the Greek Revival house at 1073 Georgia Avenue was built between 1838 and 1839 by James Goddard of Athol, Massachusetts. Goddard sold the house only a couple years later to another Massachusetts native, George Newhall. In 1846, Isaac Scott, president of the Macon and Western Railroad as well as the Upson County Railroad, purchased the house. Railroads were a very important part of Macon’s industrial success in the nineteenth century, and Scott played a prominent role in that business during the time he lived in this architectural masterpiece. In 1865, Walter Arnold Huff bought the house after the Scotts moved to New York. Continuing the house’s tradition of prominent residents, Huff was Mayor of Macon from 1870 to 1880. Then in 1875, Thomas Greshman owned and lived in the house. Although Thomas B. Greshman did not serve in political office himself, John Jones Gresham, his father, served as Mayor of Macon in the 1840s and as a State Senator and Representative. Thomas Gresham moved to Baltimore in 1886, and the house went through a number of different hands until 1893, when William McEwen Johnston purchased the house for his wife, Flewellen Reese. She renamed with the house “Bonnybrae,” which it was commonly known as at least until the 1970s. During this era, the house underwent a dramatic change after notable architect, Neil Reid, nearly doubled the house and transformed it to the house we see today. In 1913, the house was converted into apartments units, and even hosted the “Hinkle Clinic” in the 1920s. The structure went through a variety of uses over the next fifty years, until the United Methodist Church purchased it in 1970. In 1976, the Bedgood family purchased the home, and the daughters still own it today. This high-style structure retains its magnificent white columns on the façade that wrap around to a secondary elevation. The spacious lawn to the side of the house, which faces the rear of Mercer University’s Walter F. George School of Law, grants views of both the original house and a larger addition on the rear. Both bays still showcase elaborate dentil work under the eaves. Today, the Bonnybrae-Bedgood House is one of Macon’s last antebellum houses without an owner. Historic Macon Foundation looks forward to working with the current owners to help market and promote the house to a new buyer for the next chapter of the house. UPDATE: A family living in north Macon purchased the Bonnybrae-Bedgood House and will rehabilitate it as a single-family home. Work is underway and the family is taking advantage of Historic Macon’s tax credit consulting service to complete renovations. UPDATE: Historic Macon purchased the Ware House and will rehabilitate as part of its neighborhood revitalization efforts in Beall's Hill. Thomas Jefferson Ware built the house at 1107 Oglethorpe Street, which still sits on a prominent corner of the Beall’s Hill neighborhood, around 1880. Ware was a city alderman and eventually commissioner of public works, as well as owning a local grocery store just blocks away from his house. Playing a prominent role in Macon’s political and social life, Ware lived in this house until 1917, when he moved to Atlanta. Upon his death two years later, his son-in-law Benjamin F. Sutton bought out Ware’s other descendants to own the house outright, though it was Sylvanus Prince, another of Ware’s son-in-laws, who actually called this place home. Although the building has had many residents, it has had relatively few owners. The house was rented out starting in the 1920s to many different people, before becoming a formal boarding house in 1940. In 1942, the Macon City Directory lists 34 adults as residents at this address with the proprietor Mrs. Maude Moat. In the late 1940s, the house became a single family home again, though the rear building was still rented to different people at various times. In 1965, the current owners purchased the home and raised their family there. Between 1968 and 1976, the building served as the Oglethorpe Nursery School, and since 1992, the structure has claimed multiple residents. 1107 Oglethorpe Street stands out in the Beall’s Hill neighborhood, not just because of its prominent location or larger size but also for its Queen Anne style architecture with free classic details. The house has a classically Victorian irregular shape, with steeply pitched gables featuring diamond-shaped louvered vents. Beneath the eaves, the structure still retains elaborate decorative braces and dentils, details that are characteristic of its style and subtype. Everything from the warp-around porch to the original double-hung sash windows still present remind those who gaze upon this property today that the family who built this house did so with care and great pride in their city. Historic Macon Foundation continues to work in Beall’s Hill and looks forward to working with the owners of the Ware House to rehabilitate the house to its former glory. UPDATE: Historic Macon purchased the Ware House in late 2015 and sold it to a family that is rehabbing it as their future home. Construction is well-underway!